I’ve always liked to publish the stories behind the great champions like Oksana Brygidyr. 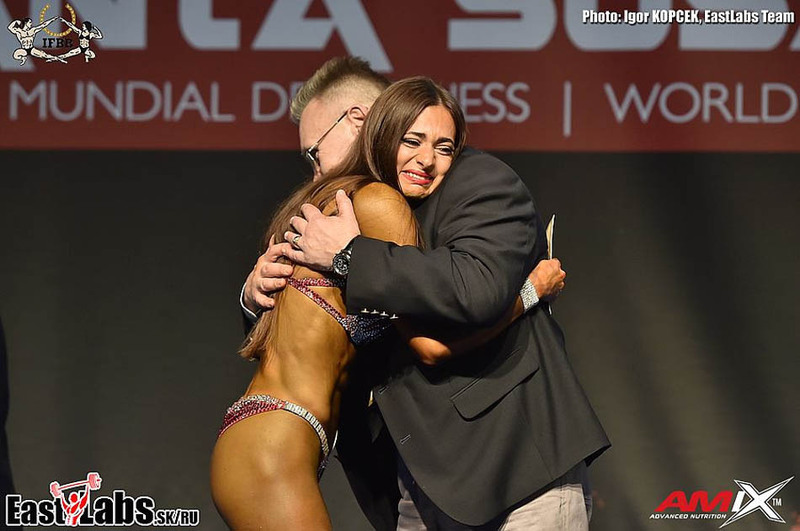 One day I had the opportunity to read part of her story on Facebook through a person who knows her very well, Iryna Delieva, International IFBB Elite PRO judge from Ukraine whom I have to thank for helping me make this interview possible. From that moment I was very interested in publishing it and today this becomes a reality. The great bikini fitness champions are distinguished by having something special and different, not just a great physicist. Oksana has the elegance, charisma and personality that distinguishes the great athletes, something that is perceived since she puts the first foot on the stage in each of their competitions. Among her many victories I can point out that she is overall champion of Mr. Olympia amateur, overall champion of Arnold Classic Europe, Overall European champion, world champion and at this moment professional athlete IFBB Elite PRO, category in which she began at the end of 2018 in Cancun, Mexico, also obtaining her first victory as a professional athlete. Oksana, welcome to TC10 and thank you for this interview. After so many victories in these years as an amateur athlete, you start your career as a professional athlete in the best possible way obtaining a new victory. What illusions and goals do you have for this new stage as a professional bikini? Thank you! I have a lot of goals, because for me it’s a new step in my career. I am very happy that i participated in Pro competition in Mexico and I won my first gold medal in Pro division. That gave me a possibility to compete in Pro World Championship. First of all, my efforts go there. As well I plan to participate in some contests in autumn. Of course my goal is to win. You are European champion, world champion, Arnold Classic champion… in your long career you have obtained many important victories. Which of these victories has been more special for you? It’s hard to say which one of the victories was the most special to me. It was not to easy to win all of my victories. For all of my preparation before the competition I put a lot of emotions, money, time and efforts. I can say that there is something special in all of my victories. Even my victories are not so special as people who surround and support me. I can say that my last World Championship was really special to me, because it was the last Championship in Amateur so I was hoping to win, and it happened. I felt a great support from my team. I will always keep remembering those emotions. Some “experts” thought at the beginning of your career that your physique was not suitable for bikini fitness, but with your victories you managed to change everyone’s opinion, prove your value as an athlete and become a reference in the category. How much have you evolved personally and mentally in all this time? I can say that this period was emotionally hard and to fight with the opinions of others was difficult. I think that with a great changing of myself and following my goals made it clear that nobody could make me change my category. With every of my competitions I started understanding what should my body look like and what the judges are looking for. And I worked on it and I vitalized myself with a gold medal every time. I want to ask you about the year 2017, it was a difficult and hard year for the athletes. It was the first year of the IFBB Elite world ranking and all the athletes wanted to score points to reach the first place in the ranking. In addition, the world championship was in December and all the athletes arrived very tired and stressed. How do you remember the experience of that year? Shortly saying it was very difficult, it was difficult physically and mentally fighting for the first place and with all the attention everybody was giving me made it difficult for me. It was a good experience for me as an athlete. I did my best and got third place. I was just happy that the year was over. I was even more happy that those trials showed who is who and who deserves what. I would like to know the beginning of your story. Each person comes to the gym for different reasons. What was your reason to start training with weights? My story is very simple and I think that a lot of women go to the gym because of this. In 2012 I became a mom and after the birth of my son I decided to keep my body in shape. 4 months after the birth of my son I went to the gym and didn’t know how to use it. I started training myself alone and 6 months after I finally got a trainer. And what was it that motivated you to start competing in bikini fitness category? My trainer proposed me. I did not accept this offer in the beginning because I did not understand what was Bikini Fitness and should I do there. I continued to do training, and in the matter of time I got an offer from my trainer to compete again, and this time I accepted it. This is how my career started in the Bikini Fitness category. Were there athletes that you admired or were a reference for you when you started your career as an athlete? Sure, it was the Ukrainian athlete and champion Alla Semenova. Her body shape and image was very inspiring. Because she was a Bikini Fitness champion many times, she was an idol to me and an example of how should a Bikini Fitness athlete look like. That was my beginning. Right know I work more on myself and my image and I can say that I stand as an idol to myself. We have seen your photos in many posing seminars as an example of how bikini fitness poses are done correctly. When a championship finishes, everyone talks about whether the physique presented was good but, in your opinion, how important are other factors such as charisma, personality, posing, image or bikini used to obtain victory? Surely everything is important – appearance, performance, charisma etc. In my opinion on 1st place there should be shape, because the judges are looking for a good proportion, muscle development and skin tone. On 2nd place I would put posing and performance. And on 3rd place- makeup bikini suit and image. Not always all 3 aspects appear in one athlete. There are a lot of examples of when athletes won without beautiful hairstyle and makeup but with a good body shape and proportions. And that is correct. Of course great when all 3 aspects present in athlete and we can see a perfect image of a champion. Throughout these years surely you have also had funny anecdotes or beginner mistakes. Could you tell us one that you remember especially? In general always everything was on time, but once I had an accident that I will never forget it was Mr. Olympia Amateur (Marbella, Spain) were I won my class and we were informed that Overall will be tomorrow, but nobody told me what time it will start. At night the judges made a decision ( the athletes didn’t know about ) that the Overall Bikini will start in the early morning. Of course I didn’t know about it so I was preparing for stage after lunch time. I got a message on my phone that im going to compete in 20 minutes while I was on my balcony drinking coffee, without tanning , makeup and hairstyle. In that moment there where panic, tears and screams. . . I put everything I saw in my bag and after 2 minutes I ran out of the room. My team tanned me in panic and I thought that I will not arrive on time to go to the stage, but I did it and I arrived to stage on time. Outside the world of fitness, what do you like to do most in your free time? Maybe it sounds strange but I like to do fitness. I like to do training very calmly, not hurry and to enjoy the process. When I prepare for competition it doesn’t happen very often. When I am off season I try the max to enjoy my trainings. And also I like a lot to ski. It’s a very nice cardio training in winter. And what is that forbidden food in the competition diet that you find it hardest to resist? I enjoy a lot eating sweets. I really want sweets when I am preparing for competitions but I understand that its competition and winning or sweets and losing. You have become a reference athlete for many girls around the world. Bikini is a very subjective category in which it is difficult to always be at the top. What qualities do you think a bikini fitness athlete should have to be a great champion like you? Thank you! As for me its not a subjective category. First of all its a question to the judges. The athlete must have a goal and a great supporting team, and then she will become a Champion. And what advice would you give to girls who would like to compete in bikini fitness? First of all a girl should be able to evaluate herself, because genetically not all the girls fit in this category. My tip for a girl that wants to compete in a Bikini fitness category is to go ahead to the victory, if you have a passion and believe in things that you are doing you will get the best results. When you are no longer a competitor, would you like to continue being part of the world of competition, as a judge or helping other athletes to win? I don’t think that I want to be a judge. But I like to help to prepare to other athletes for there competition. Right know im a trainer to another athlete. I also teach posing and I prepare bikini suits for competitions at my own brand Bikidirsha Suit and that brings me a lot of joy. To finish I would like to ask you, what is the best thing that these years as a bikini fitness competitor have contributed to your life? A lot! It’s an absolutely new life for me and when everything in this life goes by my plan then im the happiest person in the world. New friends, countries, emotions-A new step in my life where I realize myself. Oksana, thank you very much for this interview, it has been a great pleasure to know you a little better and i wish you many successes in the future.